You are here: Home / Ethnic Groups / The People of Kalimantan / Who are the Pontianak Malay? Who are the Pontianak Malay? The Pontianak Malay live in the Pontianak Regency of West Kalimantan. In their area, the Pontianak Malay live beside Chinese and Madurese people. In a few places, the Pontianak Malay also live near Sambas Malay people. The Pontianak Malay speak a dialect of Malay which is hard for neighboring peoples such as the Sambas Malay to understand, even though they also speak Malay languages. The city of Pontianak became the center of the Pontianak Malay Kingdom, which was founded under the reign of Sultan Syarif Abdurachman Alkadrie on October 23, 1771. The Pontianak Malay are an agrarian people whose livelihood depends on crops from their farmland. They also harvest freshwater and saltwater fish. They cultivate rice, coconuts, and rubber. Some Pontianak Malay also work as civil servants or merchants. The land where the Pontianak Malay live consists of swampy lowlands only 0-100 meters above sea level. This makes it difficult for them to obtain clean water. Despite this, Pontianak is a relatively developed area. According to some, however, development in the area has been slowed by the fact that there is only one road from Pontianak by which one can reach other parts of West Kalimantan. As a result, the city of Pontianak does not operate as an economic center for West Kalimantan. Even though the infrastructure of the city is better, its level of economic development is lower than other areas. 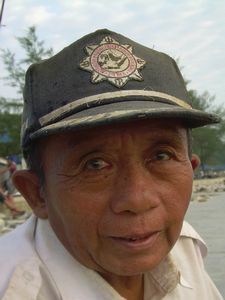 The Pontianak Malay have a bilateral system of kinship, which means that one’s ancestry is traced from both the father’s side and the mother’s side. After getting married, a new couple usually lives with the woman’s parents until the birth of the first child. After this, they live in their own home. A Pontianak Malay settlement is called a kampung. Generally, Pontianak Malay houses are built on stilts two meters high in order to protect the inhabitants from wild animals. Traditional clothing for men is called teluk belanda, which consists of a loose pair of pants called slawar, fashioned from woven silk cloth that covers from the waist to the knees, and a rimless cap called a kopiah. Women traditionally wear a long blouse called a kebaya and a long silk skirt embroidered with gold thread. The Pontianak Malay are devout followers of Islam. Their art forms and culture are heavily influenced by Islamic culture. However, they still hold superstitious and animistic beliefs. This is evident in local rituals that blend Islamic culture with animistic elements. The Pontianak Malay perform these rituals to mark births, weddings, funerals, work in the rice fields, and other events. Shamans are still very influential in the local system for treating illnesses and are consulted for advice on many subjects such as marriage plans, planting fields, or choosing names for children. According to legend, the Pontianak Malay area is haunted by the ghost of a woman who died in childbirth. “Pontianak” means “childbirth” and is now the name of the city. One of the greatest needs of the Pontianak Malay is better transportation access. Accessibility issues have caused the Pontianak Malay to lag behind other Malay peoples in Southeast Asia in terms of education, industry and standard of living.